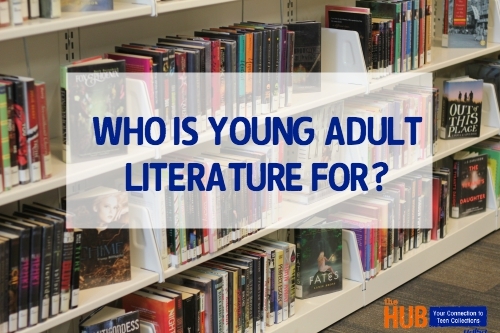 Who Is Young Adult Literature For? As a collection development librarian who selects materials for the teen collection, I’ve noticed a trend: there is more mature content in some YA books. Many books are being labeled with a 14 (or even 15 or 16) and up target audience, instead of 12 and up, the entire span of the traditional age designation of young adult literature. I am careful when I put together my orders to balance books that have appeal to older teens and adults with those titles that I can give to parents who are looking for books to ease their new 11-year-old sixth grader into the YA section of the library because he’s already read everything in the children’s room. 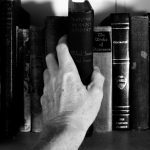 I sometimes worry that with the growing popularity of YA fiction for adult audiences, there will be a push to market YA to adult readers and the category will cater to them, and there will be less choice and variety for those readers in the range on the upper end of middle grade or lower end of YA. I want to be sure there are books for all sorts of teens represented in the category of YA fiction. When adults start appropriating YA literature, and marketing firms start defining what young adult literature is and who it is for and talking about these books in terms of profits and sales, I can get defensive. YA literature should first and foremost be for teens. Earlier this week, Nielsen, a market research firm, held a conference for “leading experts and fellow decision-makers in children’s publishing and media” and because of Twitter (and notably, Publisher’s Weekly’s Children’s Bookshelf account), many librarians and library workers, authors, as well as young adult literature enthusiasts, got to hear the discussion. One panel, a live focus group of adult readers of YA crossover books, created some controversy. The panelists seemed to be average adult readers of YA who follow the latest trends in a peripheral way rather than being deeply engaged with the YA lit community. They expressed some interesting thoughts about what YA should be and who it should be for. I used Storify to archive the conversation as reported by Publisher’s Weekly and a journalist, as well as the reactions of teen librarians and library workers, YA authors, and even an actual teen. If you want to wade through more commentary, check out the #KidsBookSummit hashtag. Some adult readers of YA on the panel explained that they like YA because “the sci-fi is better than what they can find in adult” and the category is so “accessible”, but they wished “there was less dystopia in YA, and more stories of normal people finding their way in the world, instead of fighting for their lives.” This seems like perfectly good reasons for an adult to enjoy YA. And with as many contemporary, realistic YA fiction titles as there are about everyday teens and their struggles, perhaps these adult readers simply need some quality reader’s advisory from their local library to help them find what they’re looking for in that vein. This was just the beginning of the conversation, however. These panelists also called for a renaming of the entire category—because they think young adult literature sounds so juvenile. A panelist said that instead, it could be called “pop literature” or for those that are “young at heart” rather than young adult, which is a confusing label and apparently, a turn off. Many library workers and authors took issue with this suggestion. I’m sure that marketing teams at publishing companies, who look at Nielsen’s statistic that 80% of readers of YA are, in fact, adults, are very interested in what these panelists have to say. Their interests are in turning a profit. These “leading experts” are telling them that adults who buy YA are their dream customers, because they are engaged and buy in hardback. But young adult literature isn’t a market segmentation or an abstract category to me. 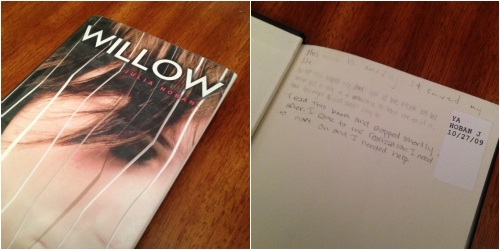 YA is Willow by Julia Hoban, which I found with handwritten notes on the inside cover that declared the book had “saved my life” in a teen’s handwriting. YA is Aristotle and Dante Discover the Secrets of the Universe by Benjamin Alire Saenz, which a teen told me she really identified with, even though she wasn’t a gay boy, because the tight-knit Mexican-American families reminded her of her own. To me, YA literature is for the girl who read and reviewed 56 YA books over the summer that she got for free from the library. It’s for the teenage boy who didn’t like to read until I recommended I Hunt Killers by Barry Lyga and The End Games by T. Michael Martin to him after he told me about the anime he likes to watch and the video games he likes to play. He now comes in to regularly ask for book suggestions. To me, and many teen librarians, YA isn’t for anyone’s bottom line. It’s one of the ways we help support the intellectual, emotional, and recreational needs of teens. I am not opposed to adults reading YA. 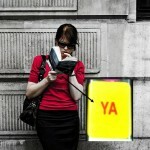 Obviously, I read YA. I lead a YA for Grown Ups book club at my library. I don’t think that adults should feel shame about reading and enjoying stories about and for teens. I want adult readers to buy big blockbuster YA titles so that publishers can bankroll quiet YA books that defy categorization and push boundaries and surprise and delight readers with the profits from the commercially successful ones. I want there to always be stories not just about, but for, teens. Consensus is Building: It’s Okay to Read YA. Molly is the Senior Librarian for Youth Services, Programming, and Marketing at Santa Barbara (CA) Public Library. She is a former member manager of YALSA's The Hub. Thank you for addressing an issue that I have been dealing with for a long, long time. The “adult-ification” of YA lit has caused me a lot of problems with developing my collection in a Catholic high school. While I try to be open and allow students to read what they want, it is really hard for me to add books that deal with more adult issues (college and beyond) for students who still live at home and haven’t necessarily been exposed, nor want to be exposed yet to the world of grown-up topics. I know our world is and has changed, but I like that they want materials that allow them to still be kids as they truly are. I understand what you mean. Why I think it’s perfectly fine that there is YA that deals with more mature topics, I just don’t want there to be nothing published for other types of teen readers because the marketplace is chasing the adult audience. 40 years ago a district librarian told me he didn’t put books for eighth graders in the middle schools because sixth graders might read them. I was a librarian who put PreK-adult books in my high school library so everyone would find something to read. And they did. I agree with you Molly , that if publishers listen to those adults who read/buy YA fiction the emphasis will change to a more mature type of book, and there will be little available at the bottom end/entry level range for those who need to be eased into this area. Many of the parents of my early teens have no idea, unless they ask me, how the themes and content change dramatically from the upper end of children’s fiction into the YA . 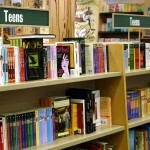 Having a range of YA Fiction suitable for the 12-14 year old readers is crucial in my opinion. Yeaaaah. I was one of those authors/librarians who chimed in. As an author, yay, i’m so happy adults read YA. I am. But i’m not writing for them–I’m writing for teens. I don’t want adults to feel embarrassed by reading YA, but i’m also not going to change what I write. Because I write FOR teens, and that’s that. And as a librarian, I want stories for my teens. I don’t want them to hear/think that their stories aren’t worth it because they’re too juvenile. Because people are embarrassed to read them. How sad is that? All said, EXCELLENT post. Thank you for writing it. One of the things that I noticed was as more adults began to read YA, the books promoted by publishers became less diverse, if that was even possible. I hope we can see a reverse of that particular trend.